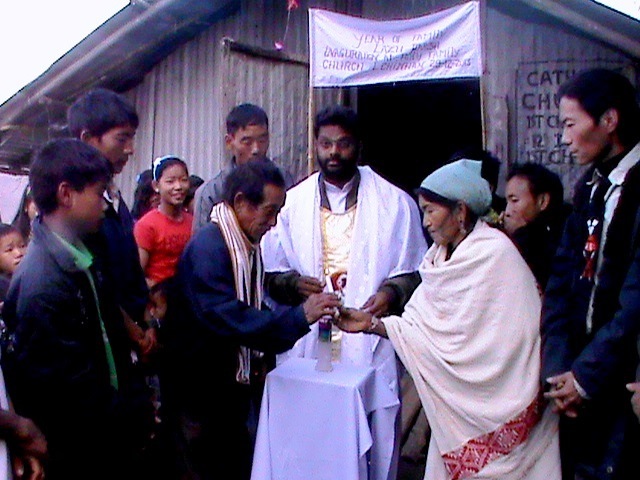 The YEAR OF FAMILY celebrations in Lazu Parish was inaugurated on 29th December 2013 at Holy Family Church in Lower Chinhan village. On the same day the feast of the Village Church also was celebrated. The celebrations began with a solemn Eucharistic Procession to the Village Church where the Youth in traditional dress and beating the drums and holding flowers and with songs welcomed the Eucharistic Lord to the Altar. Before Solemn Eucharistic celebrations presided over by the Parish Priest, Fr Joy Valliamthadathil MoC, there took place a solemn inaugural ceremony of the YEAR OF FAMILY. The Gram Budha (GB) and his wife lit candles, representing all the families of the Parish. Representatives and faithful from all the Villages of the Parish participated in the feast Day celebrations and the inaugural function.